Fried Okra Bites - OMG! SO good! Quick homemade cornbread muffins with cheese and fresh okra. Great for parties and an easy side dish. Only 5 ingredients - self-rising cornmeal, buttermilk, oil, cheddar cheese, fresh okra. Ready in about 10 minutes!! These Fried Okra Bites are a new favorite. Mini cornbread muffins with fresh okra mixed in the batter. OMG! SO good! They taste just like fried okra! I happen to LOVE fried okra, so these Fried Okra Bites were right up my alley!! 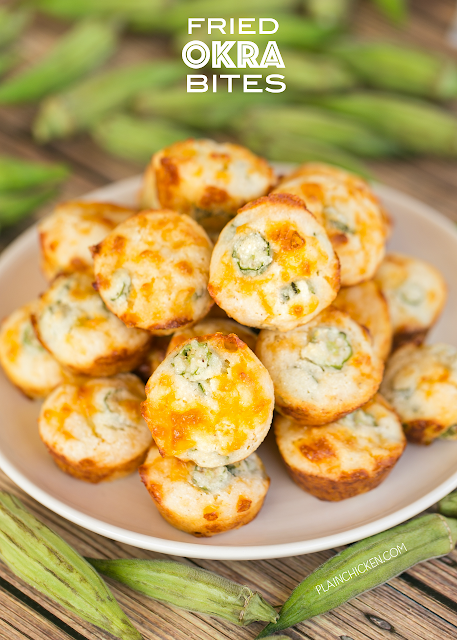 I loved the addition of the cheese to the okra muffins. I used cheddar cheese, but these would also be great with some pepper jack cheese. Really, any cheese you like would be good in these muffins. We served the Fried Okra Bites as a side dish, but they would also be great as an appetizer for a spring/summer party. Just an FYI - I used White Lily Self-Rising Buttermilk White Cornmeal Mix in this recipe. If you can't find White Lily, you can use any brand of self-rising cornmeal mix. I like white cornmeal, but yellow is perfectly fine. 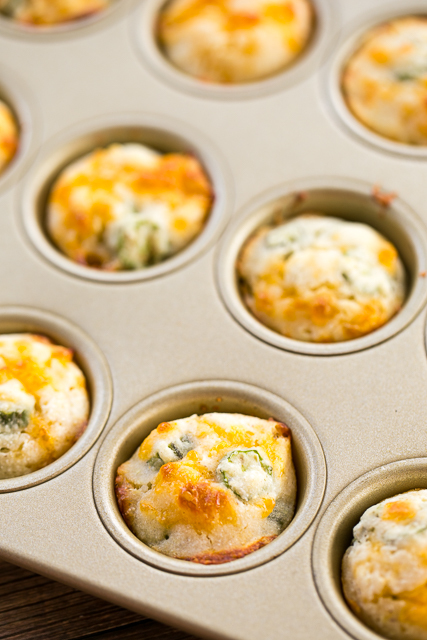 Preheat oven to 450º F. Grease 24 mini muffin pan cups. Set aside. Microwave okra in an microwave-safe bowl for 1 minute. Combine okra, cornmeal mix, buttermilk, oil and cheese. Pour into prepared muffin pan. Bake for 10 to 12 minutes, until golden brown. I can't imagine what these taste like but I think I'm going to have to make some!! My husband loves okra cooked every way . . .I only like it fried or grilled (my new favorite!!). Should'nt these be called baked okra bites? Well, I'm calling them Fried Okra Bites. so....nope. These look awsome. Can not wait to try them. These look like a good way to use my frozen okra from last year's garden...however, I have them frozen as full pods--I've only used them so far to make gumbo...do you think thawing them and cutting them in pieces would be o.k. for this recipe?? I think that would work great, Karen. Enjoy! Do they taste like fried okra rather than other okra? If so that's great! Frying okra is a pain but it's the only way my hubby likes it! I thought they tasted like fried okra. Fried Okra is my favorite, but I agree that it is a pain to fry it. I do it because I love it so much. These little bites are a great alternative. I have some pickled okra in my pantry... What are your thoughts on using those in this recipe? That actually sounds good. I would skip microwaving the okra. Gave these a try, though I added a little salt, chopped jalapenos and a little bit of pickled jalapeno juice just to give them a little kick. Ohhh this sounds delicious! I can't wait to try your "FRIED" Okra Bites. We actually fried up some okra tonight for dinner. It's not hard to do. It can be a pain at times, but is fairly simple. I bought some frozen breaded okra once because I was pressed for time for a short notice dinner party and thought why not. How about not. It was the worst okra I ever fried. None of the breading stayed on. Nearly all of it all fell off. Nothing like mother's fresh fried okra or my mother-in-law's. You'll never see me buy that in the frozen section ever again. Can't live without fresh okra. Could I use regular cornmeal? These sound delicious!! No. You will need to add baking soda and salt to the plain cornmeal to make it self-rising. Just google it for measurements. Enjoy! Could you use jiffy cornbread mix? Thank you! I made these in a regular size muffin pan for dinner and everyone absolutely loved them! I will definitely be adding this recipe to my cookbook!